When I was young, my dad used to tell me stories about how every time he used to visit Jama Masjid (more specifically Karim’s) way back in 1980s, the servers and the owners used to be greeting them, to the extent of even remembering their favorite dishes and how eating at these places was more gratifying than eating at a 5 star hotel, which was a big deal in those days. I never used to get it then but now I realize that Jama Masjid’s food has always been famous with food lovers around Delhi for a long long time, much before I was born too. So when I heard of Al Karam, opening its third outlet in the heart of South Delhi, I was a little skeptic whether they would be able to do justice to the rich cuisine fit for royals. Boy was I wrong!!! The original Al Karam in Jama Masjid was started by Varun’s partner Umez’s father. Al Karam has existed in the walled city of Jama Masjid close to 65 years now. It was one of the earliest biryani eatery in Delhi. After taking over the effort has been to balance the traditional and contemporary for example using “meats” that aren’t traditionally a part of Mughlai cooking repertoire. This restaurant now reflect the passion for food from quality to quantity to pricing. Varun Veigas’s Al Karam (which I prefer to call it now) has taken that passion for food from the streets of Purani Dilli (Old Delhi) and for me is high up on that scale. Lucky for us Varun invited the members of The Delhi Foodie Club (TDfc) to his freshly opened outlet at Satya Niketan right opposite Sri Venkateshwara College. Never having tasted the Al Karam food before and considering it to be another copy of the Jama Masjid fare, the foodie in us still wanted to try it and we accepted the invite, strictly on a pay per person condition though subsidized. 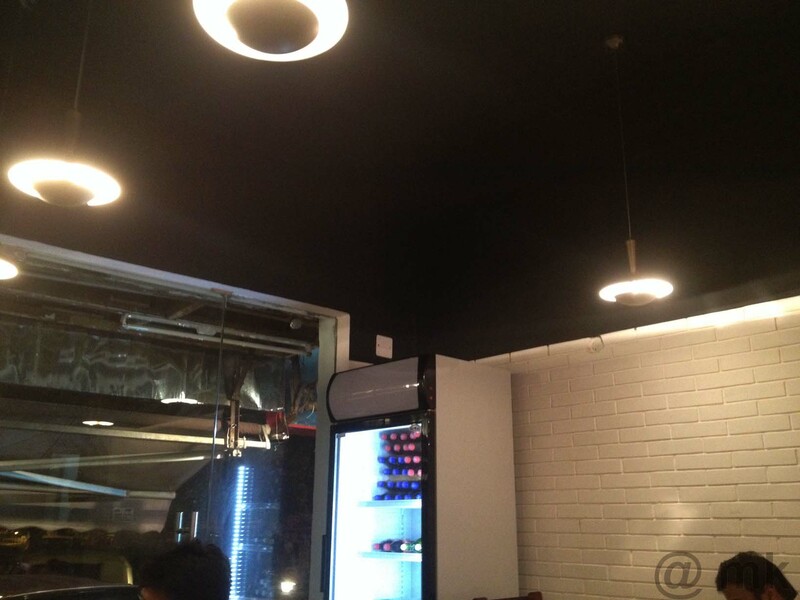 A small place with seating for 18 – 20 people, but an old world charm with the wooden bench like seating and dark ceiling! A small restaurant with a seating for around 20 people, Al Karam is quite visible from the main road with its bright red glow sign board advertising Kebabs, Rolls, Nahari & Haleem. All specialties of Purani Dilli, Varun and his partner Umez have got it perfectly right for the meat lovers of Delhi. With wooden benches and textured Ivory coloured walls you are transported to the feel of an Old Delhi restaurant and its dining hall. No frills and no non-sense form the basis of Al Karam’s interior space and the simplicity is filtered all the way down from the décor to the servers and the straight forward service with a smile rule. Hospitality has always been rated highly when you are eating in the lanes of Jama Masjid, and Varun has not only picked up the food and but also the concept of feeding diners like they were dining in his own home, which he believes they actually are. There are a few restaurants which are hospitable from the heart and treat guests with respect, and this place serves you direct “Dil Se”, a phrase coined by a fellow foodie friend of mine. The experience left me and others spellbound and satisfied at what these guys could conjure up for us in a small place. Al Karam, though a small outlet, is big in flavours and that is what will make it stand out as tough contender to other restaurants trying the same cuisine. I have a lot of friends who want to try the flavours of the walled city but are apprehensive to venture through the lanes of Purani Dilli. For me the food served by Al Karam would be the closest and maybe better than what you get there. We let Varun and his team decide what was going to be served to us and over time I have realized that is the best to eat at a restaurant. Who would know better than the creator himself? We started with the Mutton Gilafi while waiting for the rest of our mates as the aroma from the barbeque was getting unbearable and we had to start sampling the goods without delay. Varun had been forewarned about my love for meat and the assortment of Kebabs which started was mind boggling. Mix together with Mince Mutton, chopped onions, green chillies & coriander, the Gilafi was already being cooked on the charcoal when we had arrived and by the time it reached our table it was extremely well done with the aroma of the black coal which any Kebab lover swears by. An undulating texture while holding it converted into a softness so smooth it melted in the mouth as butter does. I finished a plate of 4 thick Gilafi Seekhs single handedly. An amazing start to our meal I could hardly wait for the rest. Most of us who have visited Jama Masjid know about literal butter chicken one gets there. 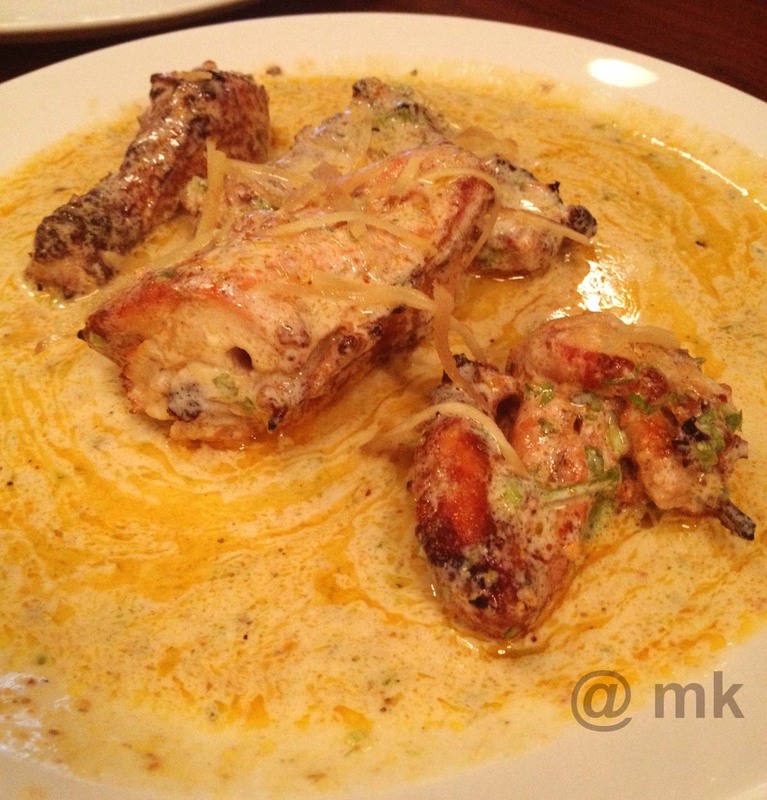 It is purely just Roasted Chicken poured over with a “cocktail” of yellow butter, dahi (curd) & some spices. 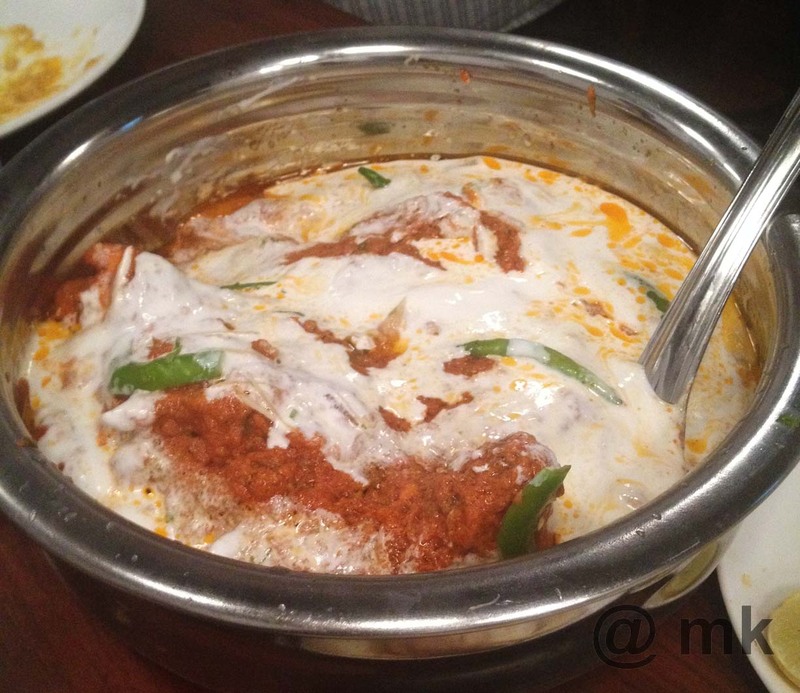 Purani Dilli ka Butter Chicken is what we were served next along with a set of Roomali Rotis and Khameeri Roti. Talk about being spoilt for choice and only 2 dishes were served till now. The Chicken was juicy with the flavour of the marination completely dissolved in it and the left over gravy was polished off with the thick Khameeri Roti. Tandoori Duck … the star of the evening! We were silently eating without talking much, for obvious reasons, when our gracious hosts served us a dish which was to be the star of the evening. They challenged us to guess it and we had not imagined that we would be served Tandoori Duck, a speciality of the restaurant which is only prepared on 24 hours notice by the chef. In Varun’s words “It is marinated with your usual aromatic spices, tenderizer and ghee. Roasted in the tandoor and basted with more ghee, orange juice and the aromatic spice rub.” I don’t know the details of the aromatic spicy rub, but the aroma and the taste were something I have never sampled before. Never have I taken in a dish which looks tastes and smells so good all at the same time. For no other reason, if you are a meat lover, you have to visit Al Karam only for this. 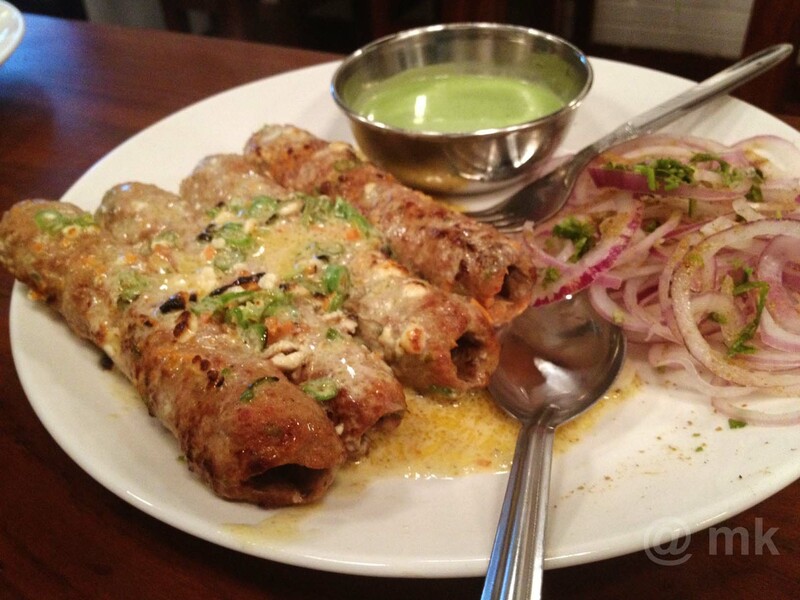 Sutli Kebab, which has earned its name just for the fact of being tied with a sutli (thread), arrived next. A Kebab so soft it has to be tied around, and this softness was what we experienced when we untied the thread and devoured the kebabs. Originally made with buff we tried the mutton counterpart and the mince mutton flavour similar to the Gilafi tried earlier. I am sure the buff tastes much softer and juicier as this one was a little dry to my liking. I quickly moved onto another speciality on which was already on the table. Roasted Quail … another speciality!!! Another bird on the menu which requires a 24 hour notice is Roasted Quail or more commonly known as battair. The first time I tasted Quail and I thought the meat was much tender than chicken, though lesser in quantity. The size seems like a small chick and the spices were well grounded into the bird. The meat came of easily of the bones and I loved chewing on the charred portions of the meat due to the excessive grilling at ends. The Quail roast is another reason to visit this place. I have to tell you so much eating in one go did leave us a little overwhelmed and when Varun and Umez bhai announced that the main course was ready, we could not help but laugh. Now when I tell you we eat a lot, we really do and even this kind of hospitality was way over the top. The hospitality did not just rest at our table but two young guys were experiencing it too, when they were being served more food than they had ordered compliments of the owner. Well back our table we had to order a round of Thumbs Up, which we all bottled down NEAT, ready for the next round. 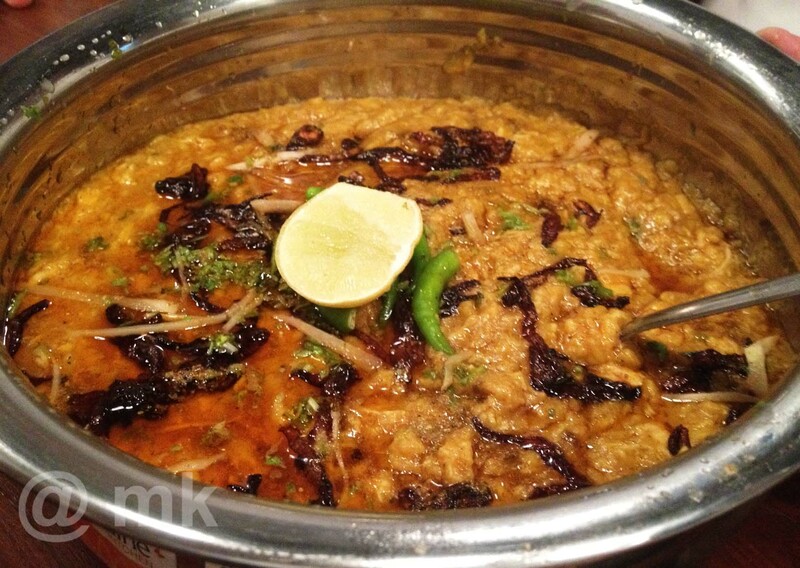 One of the best Haleem I have tasted … Well grounded and smooth! The main course was Haleem, Chicken Changezi, Beef Nahari & Chicken Badami accompanied with Khameeri Roti & Sheermal. Refreshed from our bout of cold drinks we attacked the main course with renewed vigour. For the uninitiated, Haleem, was originally cooked during the month of Ramadan, is made of lentils, meat and wheat, garnished with fried onions, chopped coriander and lemon juice. The Haleem served here was one of the best I have tasted, well grounded and smooth. Perhaps, the only way I would prefer to eat Dal (lentils). We polished of the Haleem with some potent Sheermal, a sweetened Naan almost similar to a Danish pastry in taste. The Beef Nahari cooked in its own fat which can be seen floating in the dish when served is another speciality of Al Karam. 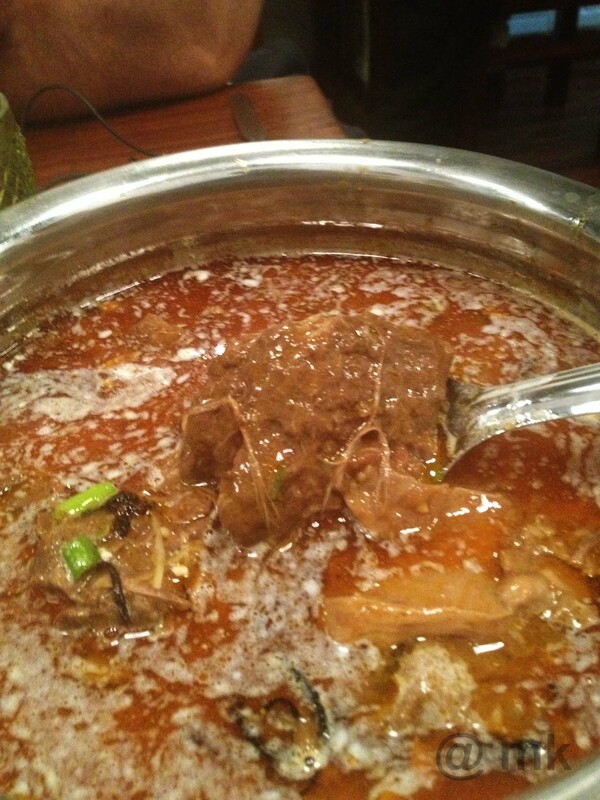 Advertised in bold letters on its Glowsign board, the Nahari (not Nihari) is a stew consisting of the meat which is generally eaten in the morning, hence signifying its name. Traditionally cooked over night in a Deg (large utensil), the morsels were extremely tender and full of flavour of it’s own gravy. The meat was falling of the bones on touch and the Khameeri roti was a great accompaniment to savour the rich gravy. By the time the Chicken Changezi and Chicken Badami were served, I was upto my neck with food, but, eating such rich food requires dedication and I did give in to the temptation of tasting both, though will have to go back to do actual justice to them. Chicken Changezi … have to go back for more of this! Having devoured such rich food non – stop for 3 hours with only a 20 minute break, left us pretty satisfied with the both the food and experience. 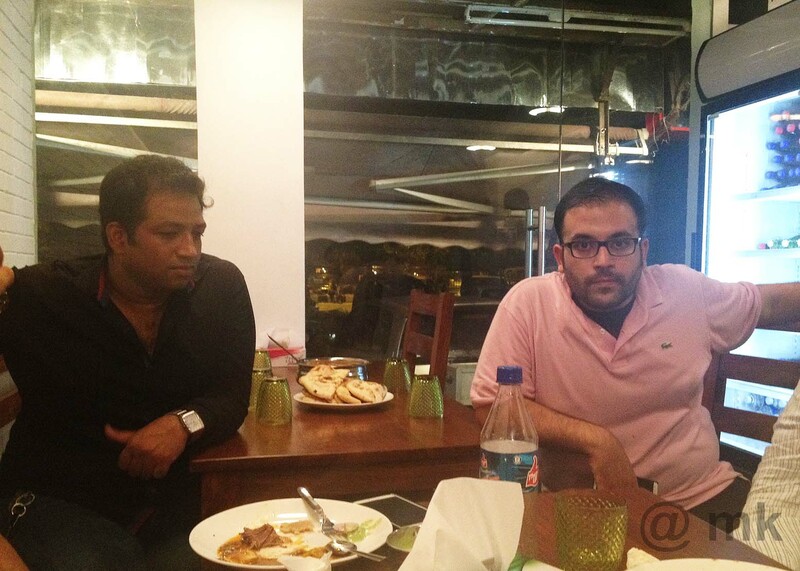 Umez bhai however insisted that we cannot leave without trying the desserts. Varun told us that their chef originally worked with a sweet shop and he had created his own version of Gewar resplendent with dry fruits along with Phirni and the Mango flavoured Kulfi. Even though I don’t have a sweet tooth I had to eat all this since Varun & his team would not lets us say no. However, no complains here too, and I am sure if you are a sucker for desserts, you will just love them. 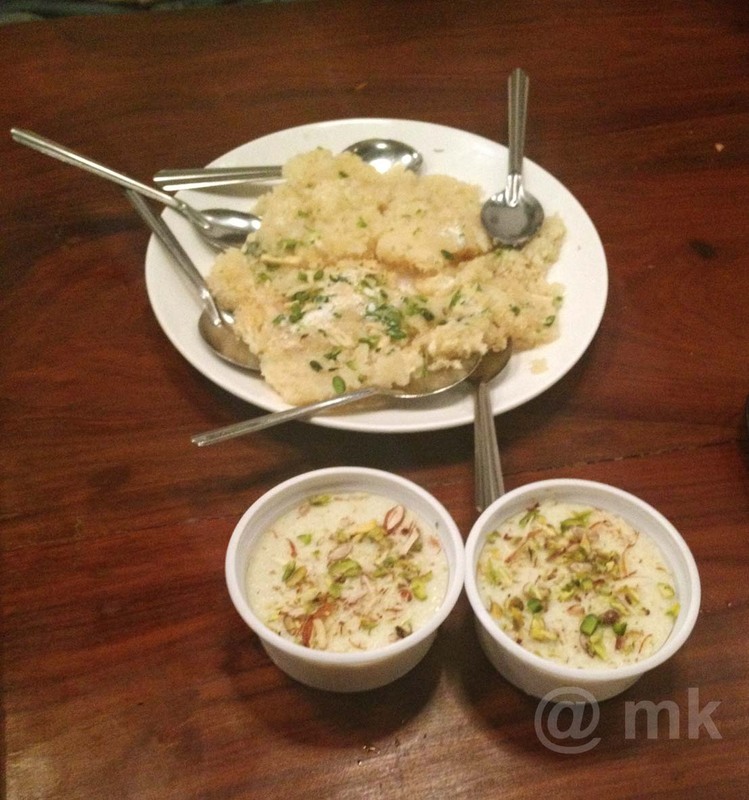 Gewar & Phirni … was too full to lift up the camera and click the mango kulfi, thereafter. Don’t be surprised but we had a vegetarian foodie accompanying us and he was really bowled over by the herbivorous food. I apologize that I won’t be able to tell you much about it, but maybe someone else will soon. But, the point is no worries if you have a Veggie family member or friend accompanying you to this place too. This entry was posted in Food, India, Lifestyle, Photography, Restaurant, Review, Uncategorized and tagged Al Karam, Beef, Butter Chicken, Chicken Badami, Chicken Changezi, Food, Gewar, Gilafi, Gurgaon, Jama Masjid, Karim's, Kebab, Kulfi, Mughlai Food, Nahari, Nihari, Old Delhi, Phirni, Purani Dilli, Quail, restaurant, review, South Delhi, Sutli Kebab, Tandoor, Tandoori Duck, Varun Veigas. Bookmark the permalink.